I spent some time on Thanksgiving thinking about what I was thankful for, especially this year. I'm thankful mostly because my walk with the Lord has deepened this year which has made me look at things differently. I'm also thankful for my family and friends. Today I'm going to spend some time with my three granddaughters (and the rest of the family, too), decorating our Christmas tree. It should be interesting since one of my granddaughters is 17 months old. I'm also going with a good friend to lunch and a movie, Australia. Now if I could write about 2000 words that would be considered a perfect day to me. I'm thankful I've finally realized I'm finished with teaching as a job. I've done two long term sub jobs since I retired last January and I know that I truly walked away from teaching when I retired. I want to commit myself to writing full-time. My focus in my life is changing and I'm excited to see where it leads me. I'm also thankful to have a wonderful husband who understands me and is my best friend. I have to say I'm not so thankful for having a third cat--an abandoned kitten. She has managed to shred my furniture and destroy a few other objects. Okay, I love animals and I know she will settle down over time, but it's been a long time since I had such a young animal. I think the Lord is trying to teach me patience. Now if I could just keep Ringo, my twenty pound male cat, from teaching her all his bad habits, that would be an accomplishment! I've been blessed in so many ways. Yesterday I spent the day with my family, ate too much, laughed a lot and Thanked God for all that I have. As I sit in a recliner in my mother's living room surrounded my my sisters and my mom, my wish is that this holiday season you will all know and feel the love and comfort from the people you love. I also hope that for those who are separated from their families that you are embraced by friends and your community so that you know and feel love during this holiday season. Today is a big day for shopping for so many people. Watching the news I see how people have stood in line for Black Friday sales in the freezing cold to get a bargain or too. As you're out and about shopping, consider picking up an extra gift for someone who is less fortune and dropping it off at one of the centers who have gift giving programs. Years ago I stopped doing the buying and handed over the task to my children. I would take them to the store with a list and ask them to pick out a toy that they like for a child their age. I wanted them to learn to think of others and not just themselves and was always warmed by the their excited faces as they wondered if the child they'd bought the gift for would like it as much as they liked it. Contact your local school, church or police department for programs in your area that have gift giving programs. And while you're out doing your Black Friday shopping, pick up an extra gift and make someones holiday season a little brighter. Enough said :-) God has been so good to me! Three beautiful gifts from heaven and the knowledge that another waits in heaven for us. I have been blessed with smart, beautiful, fun-loving children. Kids who push me, challenge me, love me -- even when I have to spend time writing and on other projects. I can't imagine my life without them and am so grateful that God has entrusted them to us. God has blessed my dream beyond anything I could imagine. And as you read this I'm preparing ot send the sequel to Deadly Exposure to NYC; I'm opening the content edits for the first book in the Ohio World War Two series: A Promise Kept; and I've turned in all the edits to The Complete Idiots Guide to Business Law. It's been a crazy fall, but God is good. And next month I get to dream new proposal into being. What an exciting business! We all know it’s better to give than receive, and what better way to show our thanks to the brave men and women in uniform deployed far from home than to send a Christmas Care Box. Army Chaplain Kevin Peek hopes to receive gifts for 1,000 soldiers stationed in Iraq this holiday season. Want to help? Go to your local Post Office and pick up an APO mailing box, which has a flat-rate shipping cost of $10.95. Fill the box with any of the items listed below. Attach a customs declaration, which you’ll also get at the PO, and list the items included, such as books, toiletries, Christmas ornaments. Foot powder and creams, Gold Bond, athlete's foot, etc. Puzzle books, suduko, logic, crossword, jumble, etc. Seal toiletries in plastic bags to keep them separate from food items. There are 10 female soldiers who would like soaps, creams and lotions. If you send a box specifically for a female soldier, please label the outside accordingly. This Thanksgiving, I give thanks for all of you and the help you’re able to provide to our military heroes! May the Lord keep you and them in His care. Today we're welcoming Amber Scott, the heroine of Shield of Refuge, November 2008 release by Carol Steward. Wow, you've just had quite an adventure. I have just recently taken over my grandmother's bakery and am turning it into an all-inclusive party store. I'm a party planner, cake decorator and shop owner of a party store for those who do like to coordinate their own parties. I was delivering an anniversary cake to the restaurant for a customer. When I came out of the inn, I saw a police officer and woman arguing – and then he forced her into his car. I don't like cops anyway, so I was terrified to say anything at first. Then I was doubtful that he was really a policeman. I tried to follow them in my mini-van while I called 911 to verify it was a real officer. During the chase, I ran into a police SUV and flipped it over. Turned out, Garrett was driving. 2. So, during the book you met Garrett Matthews. Tell us a bit about him. What was your first impression? When did you know it was love? My first impression of Garrett was 'Thank God, he's alive.' I was surprised to find out that he had a sense of humor, even after I'd toppled him. It was impossible not to find him likeable, but since I don't like cops, I kept expecting him to cuff me and throw me in jail. It didn't help that at least a dozen officers were glaring at me and treating me as if I'd hit him deliberately. It didn't take long to realize that Garrett is extraordinary. He should have hated me for running into him. It jeopardized his chances for his dream job. It ruined his perfect record on the police force. I can list a dozen reasons why he should have, but he didn't. Garrett is the youngest in a long line of law enforcement officers. So he made it very clear that that wouldn't change, no matter how much he loved me or how much I wanted him to find another career. But being Garrett, he dealt with everything very directly. That's very reassuring to always know where we stand. I'm creative. I love to bake and plan celebrations. It was my escape from family problems as a teenager, and I found out God has blessed me with a skill that I can use to make others happy. My weakness is setting work hours, not letting it consume me. The rise in crime scares me. It's so senseless. Even falling in love is frightening because I'm afraid of losing those I love. Giving your heart to someone takes courage. When I was a teen, my parents divorced, and that rocked my foundation. I'm learning the importance of relying on my faith in all aspects of my life, thanks to Garrett, and his family. I'm learning to love and let God mold us for one another and beginning to really listen to God's guidance. To set aside time for myself and my relationship with God. I'm always on the run, and I tend to give God what is leftover instead of giving him my first priority and letting Him make time for the rest of life. Since I tend to be a little hyper, time gets away from me. I can't help but push to get a little more done. That gets old for those around me because I tend to push them, too. Definitely a fledgling Christian. I wasn't raised as a believer. I took a lot of wrong turns during my late teens, and it took hitting bottom to listen to anyone else who suggested I might find peace with God. I resented it. Until I realized I was going to hit head-on with a life of misery. I went into it very skeptical that even God could help turn my life around. I'm still learning. I know that being a Christian doesn't stop the ups and downs of life, but it's truly different with God. He never abandons us. It's not that I'm without fear of bad things happening, but I know that I won't be alone. God has our lives planned from the day we are conceived. He knows our every weakness and flaw, yet he loves us unconditionally and offers us salvation, just for loving Him in return. We weren't promised a perfect life. In fact, we're assured that we will be tested. We are born with the shield at our service, yet in order to use it, we must seek Him. Eggnog Pie. It's the one pie that my grandmother only made for family occasions, so it was extremely special. It's also unique. I think all of us should feel unique and special. After all, God created us to be like no one else. Yummy sounding dessert! Thank you Carol for sharing Amber with us. This book sounds like a perfect Holiday read. Margaret's post inspired me. It was interesting to see what her office looked like. I loved the color and the flamingo! Here's my office. We moved into our home just over seven years ago. We're in the historic district of Scottsdale, AZ. Yes, there is a historic district. We're pretty amazed too. Our house is just over sixty years old. Here in AZ, that's old. See, we only became a state in 1912. We're the 48th state. In Boston, people own shoes that are sixty years old. They laughed when my neighborhood became historic, but I digress. We purchased the home seven years ago, and we're remodeling as we go. Hence, the dark, wood paneling on the walls of my office. My office started life as landscape. Yup, the house ended two rooms over. 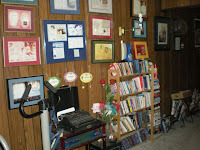 Then, about twelve years ago, the home's second owners turned it into a mother-in-law's room. This room is what sold the house to me (you should see the master bathroom TILE, THE BATH IS COMPLETELY MADE OF TILE. YUK! Needless to say, the master bathroom is why we had to come back three times before deciding to buy. I hated the bathroom that much - think burnt orange). I saw potential, though, in the mother-in-law's room. It would make a great office! I have dark paneling on the walls. But, I've decorated those walls nicely with, like Margaret, framed covers, and also pictures of my family, a giant calendar, and books, books, and more books. I don't really have a theme unless you want to count Early Mess. Two weeks ago my office was clean. I almost didn't take pictures this morning because my office is a mess. See, my husband bought me a new TV for my birthday (Oct 22). He's already set it up. He, of course, left the old telly on the floor. The new telly's box is also on the floor. All the DVDs and VHSs he moved are scattered on the flooor. My three-year-old's bean bag chair is in the middle of the floor. A fan my husband dragged in six months ago (when he tried to set the bathroom on fire) is still blocking my way. The lamp that didn't sell at the garage sale somehow wound up in here. And then, where did all this paper comes from. Someday the paneling will be gone and I (my husband that is) will paint the room forest green. I have cat and book wallpaper border picked out (seven years ago it was on sale. Wonder if it still is?) I'm learning to get rid of books (look, I accidentally purchased two of Kathryn Springer's new one). And as for the exercise bikes you see, someday I will really use them. Oh, and last weekend, I purchased an hourglass. Right now it's on the floor by my chair. I'm going to start using it every morning. I'm making a rule that I can't play on the Internet, blog, update my website, or play Solitaire, until after I've worked on my current manuscript. So, what does your office look like? Someone asked me to take a picture of my office for an interview I was doing for them. Now that I'm home writing full-time, I spend most of my days in my office. I have hot pink walls with white accents. 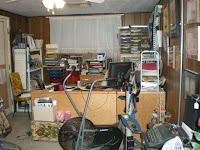 I have a desk, file cabinet and 5 big bookcases (overflowing with books). I also have a couch and a coffee table that looks like two huge books. My husband years ago when I started out selling framed each of my books and they are up on the walls around my office. In the warm weather when I'm working (my desk is next to a large window), I can look out on a garden we put in a few years ago in the front yard. We have a butterfly bush that attracts so many butterflies (and hummingbirds). It's so neat watching them. The first picture is my desk with Flo sitting in my chair. Flo is a huge flamingo given to me by Cheryl Wyatt. Thank you again, Cheryl. My granddaughters love playing with her. But at the moment she is thinking about writing a book. The second picture is a tree I leave up all year with my flamingo ornaments on it. There are a few others besides the flamingo ones that have special meaning to me. My lights on the tree are palm trees or flamingos. Holiday giving in the time of big bailouts! With the stock market falling so drastically and news every evening of thousands of job losses across America, I've been thinking about all the people who will be finding it harder this holiday season. I wonder if they live in a loving and giving community like mine. Living in a small community, people usually put on a brave face for their neighbors and friends. Your neighbor might not look like he or she is struggling. They may look like their life is wonderful and all together. But you may not know that one of them has lost their job and is in danger of losing their house. Or that they've been plagued with high bills due to health problems or other things such as high college costs or helping to pay the living expenses of an elderly parent. Or perhaps, a single mom is struggling to make ends meet with the cost of fuel, daycare and higher food prices and is wondering how she can possibly put together a holiday that her children will remember. The holidays can be pretty rough for people who are struggling and I'm reminded of that as I watch the news of high foreclosures and I drive through town and see more For Sale signs than usual on houses in the neighborhoods. I'm a firm believer that God helps those who help themselves and those who can't help themselves. And for those who are struggling, I believe God works through the hands of those in the community to help make things easier for people who are struggling. In my community there are many programs that help struggling families. One of them is a Holiday Dinner Basket program where businesses and members of the community donate, assemble and deliver holiday food baskets for Thanksgiving and Christmas. For some people, it's tough to accept what they feel is a handout and not a gift and many times there are tears on both ends when a Holiday Basket is delivered. But in the end, it's the giving from the heart that is remembered the most and the knowledge that the holiday will be so much brighter for both families involved. My community has many other programs that bring people together this Thanksgiving seasons I'm thankful to be living where I am, knowing that there are so many wonderful and giving people in my community. What are some of the special programs in your community? Post a comment and let me know. You never know if someone will read your post will spark interest in the mind of a reader only to have them implement your program in their community. Karen Ball is continuing her series on Christian fiction and what it is. As she mentions and as your comments from last week reinforce, this is a hot topic. I remember the discussions she refers to -- um, I think I helped instigate the one at ACFW with my check the box conversion scene comment while moderating the editor panels. I am such a troublemaker! Karen's latest post included the editors thoughts. Insightful stuff. And the comments on that post are detailed. People really care about this topic! Frankly, writing stories that address the hard, real-life issues is excruciating. 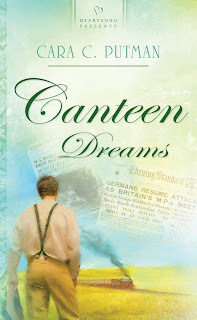 The last novel I turned in dealt with miscarriage -- the first book in my Ohio World War Two series. 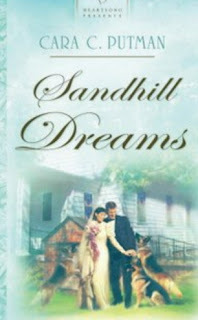 Colleen calls it my historical, married romance, women's fiction. I knew it was a thread I had to write, my editor embraced it, and it is real life. The gritty, ask God hard questions, kind of life. But it's painful as a writer to go there. In my case go back there, and dig up the emotions, the pain, the questions...but that's what leads to the answers and piece of truth God has revealed to me. The content edit is also pretty substantive -- pushing me to go even deeper with the characters and their motivations. Talk about a gift as a writer, but I know it will pull even more out of me. 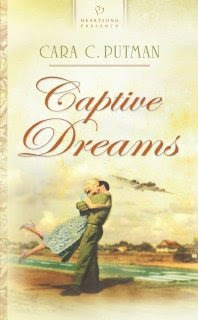 Sharon Hinck talks about the pain that came in writing scenes of the Restorer's Journey (3rd book). It's bleak, dark, harrowing stuff, but the truth and light of God shines through. And it's in those pages that I was challenged in my own faith. As a reader, I seek those kind of experiences. As a writer, I have to be willing to dig deep, peel back the layers, be transparent (though the reader shouldn't sense me in those places -- just the truth as experienced by the characters). And the hard part is that each book requires that laying it out, risking, and being vulnerable. Seven random facts about reading? 1. As a young child, I loved fairy tales, which my mother often read to me. Hans Christian Andersen and the Brothers Grimm filled my head with wonderful stories of good versus evil, mans inhumanity to man and logical consequences. Many of the fables and fairy tales were dark and foreboding . . . perhaps the reason I've turned to suspense as an adult. 2. Fast forward to the books I read and treasured as a child. Charlotte's Web tops the list. 3. I read every Nancy Drew published in those days. The Secret of the Old Clock, The Password to Larkspur Lane, The Clue in the Diary . . . the titles bring back memories of Saturday afternoons curled up on the couch when I solved the mystery along with Nancy. 4. What girl didn't love Laura Ingalls Wilder? 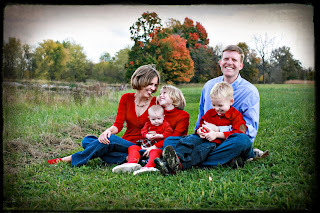 Even today, I find myself wondering how Laura and her family survived The Long Winter. Remember the cold, their hunger, the tiny fire fueled with . . . am I remembering correctly . . . cow patties? 5. My all-time favorite book? Rebecca by Daphne de Maurier. Receiving the Daphne de Maurier Award for Inspirational Suspense this past July was extra sweet due to my admiration for and love of her work. 6. Edna Ferber was another author who caught my fancy. I read all of her books over summer vacation, probably sometime between fifth and sixth grade. 7. James Michener has always been an author I loved to read. I started with The Source, which I read in high school. Hawaii was another favorite, and his words fill me each time I experience the beauty and culture of the Islands and the Hawaiian people. Other sagas of his that touched me were Centennial and Chesapeake. 8. Although I only needed 7 random facts, I had to mention Exodus by Leon Uris and The Wall by John Hersey, which made the holocaust and the plight of the Jewish people in Nazi Germany during World War II become real to me. We need more holocaust stories today so the world will never forget what happened and so heinous atrocities never occur again. Thanks for stopping by today. Hope you'll share your favorite childhood reads! I'm tagging Mary Connealy, Missy Tippens, Nancy Northcott, Camy Tang, Anna Adams, Walt Mussell and Myra Johnson. Today we're welcoming Anna Freeman, the heroine of Holiday Illusion by Lynette Eason released November 2008. Wow, you've just had quite an adventure. You’re not kidding! I just couldn’t believe it when it seemed my past had caught up with me. Whew! Where do I start? It all just seems so unreal. Unbeknownst to everyone back in the United States, I worked with at the Amazon Orphanage in Tefe Brazil, I used to be an FBI agent. Before I ran away from a very painful incident, I worked undercover quite a bit. Unfortunately, I had a case unravel in a way that left me vulnerable and I was shot. As a result, I was unable to have children and ran to Brazil as a way of escaping my pain. And, to be honest, it worked…a little. And then I met Paulo, a little boy at the orphanage who needed a heart transplant. His only hope was America. I agreed to go with him and ended right back in the city I’d run from four years ago. 2. So, during the book you met Lucas Bennett. Tell us a bit about him/her. What was your first impression? When did you know it was love? I met Lucas about a year after I fled to Brazil. He was the local doctor in Tefe and often made visits to the orphanage. At first, I was in such a depression about all that had happened, I didn’t give Lucas the time of day. Then I started to heal, emotionally and spiritually. Somehow through all of that, Lucas became my best friend. Then, through caring for Paulo, we spent more and more time together and our feelings evolved into much more than friendship. I fell for Lucas in a big way, especially when he was so determined to protect me from the people I thought were trying to kill me. 3. What strengths/skills do you have? What is your greatest weakness? I’m a trained FBI agent so I have a lot of skills most people don’t have in that respect. I also had the capacity to put personal hurt and worries aside and care for a sick child. One thing I had to rely on through everything was the Lord. Without Him, I never would have made it through everything I did. 4. What scares you? Being alone. Oh, I know I’m never alone with God, but sometimes it’s just nice to have someone there that has skin on, you know? And because of my past and the fact that I can’t have children, I was afraid I’d never meet a man who could accept that fact about me. 5. If you could change one thing about yourself, what would it be? I’m really stubborn. I like to figure out what needs to be done and then do it. I don’t like to ask for help and as a result find myself in trouble sometimes. 6. Where are you in your faith at the start of your story? Relying on God. He was all I had to hang on to through the terrible times in my life. I have to say, throughout the story, I asked God what in the world was going on and why all this was happening, but I also have to say He never gave up on me. 7. Where are you in your faith at the end of the story? Still relying on God. Still in awe of his unconditional love and abundant blessings. And Lucas came to see this, too, which was an answer to prayer! In the first part of this scripture, it talks about God’s divine power giving us everything we need for life and godliness. But this is only through Him, the one who has called us to live that life for Him. It also talks about escaping the corruption of the world caused by those that don’t follow Him. And I think that this is what I found myself hanging on to through the entire story. I managed to escape to Brazil, become invisible as I allowed God to heal me, both spiritually and physically. And then, of course, I needed to escape those who were out to do me harm. I just love those verses because they reiterate God’s promise to be there no matter what if we’ll only trust Him. 9. If you could be a dessert what would you be and why? I’d be chocolate because everyone would love me! Ha. What an exciting adventure! Thank you Lynette for sharing Anna with us. Looking forward to reading this story. I read with interest (hmmm, so many of my college freshman start with this line and I always frown) Margaret's post about speaking. See, I went to a writers' event on Saturday and was a speaker, too. I'm actually one of those clearly mentally ill people who like to speak. In fact, I'd rather be upfront than in the audience. But, then, I'm a college professor and love having a dry erase board behind me and people's hand in the air in front of me (since I write suspense, I should tell you that in class the hands are up because they have questions... in my books the hands are up because guns are pointed at them). I've learned a few things over the year from people who clearly belong in front of groups. 1) Dress like a professional. I was at an RWA conference many years ago and came across a fellow Desert Roser in the lobby. She was dressed in a three-piece suit. "Going to your editor appointment?" I asked. "No," she responded, and proceeded to tell me this was a 'business' conference. Now, I'm not going to do a three piece suit for RWA workshops (Her: size five. Me: size if I tell you I'd have to kill you by sitting on you). But as I watch her career soar, I realize that she is correct. This past summer, I spoke to a group of writers. My sister came with me. She wanted to know why I was dressed up. I told her. After the workshop, she said, "Pam, you're right. There was a big difference in the way the audience looked at the people dressed professionally compared to those who came in their sweats." Keep in mind, this advice is only opinion, but it's working for me. 2) Remember your audience is there to learn technique. If you can teach technique via one of your books, do it. Don't randomly push your books if they don't relate to topic. I figured this out during someone else's workshop. People were leaving because 50% of the workshop was her lesson and 50% was her personal story. A little personal story goes a long way. A lotta personal story clears the room. 4) Have handouts that require the audience to fill something in. 5) Involve the audience. If someone makes a point, let them finish. The best teachers are just a part of the process not the whole. 6) Give away your books. 7) Get names and addresses for your newsletter (You do have a newsletter). 8) Pass out promotional items. I took a 100 Craftie Ladies pens to this past workshop. I came home with five. I added ten names to my newsletter list. Already two people have emailed me. 9) It doesn't matter if you have 5 or 50 in the audience, appreciate them. 10) Don't stand still, move, be personable, learn a name or two. Hmmm, I think I'll take the above 10 points and turn them into a workshop. Thanks for reading me today and please leave a comment. Have you ever found that a skill you enjoyed as a child has faded as you get older? I spent a lot of time in grade school thinking up myriad horse names..and names for the stables that I wanted to have when I grew up. In high school and college, maybe some girls were dreamily sketching out the name "Mrs--whoever" in the margins of their notebooks. I was still doodling horse names and stable names. But after raising a lot of horses over the years as an adult, thinking up names for them got a whole lot harder--and I never did come up with a good name for our stable. Worse--we did pretty well deciding on names for our two boys, but it took three days to decide on the right name for our daughter, so she could leave the hospital with a name! This week I was reminded of just how name--and title--impaired I am, because I needed to come up with possible titles for THREE books and a name for that series. Oh...and then there's another book that needs a title asap, too. What do you think about the titles of books--does they make a difference in whether or not you pick up a book in a store and take a closer look? Will a title turn you away? What are some of your all-time favorites? Have you ever been thrust into doing something you don't feel comfortable doing? I never thought of myself as a speaker, but I've been doing more and more of that lately. I use to read my speech which wasn't the best way to go for me. I would read fast. That's what I do when I'm nervous. I finally decided I've been in this business of writing for years and years. I have learned a few things along the way so I'm just gonna talk to the audience as if we are a couple of friends getting together to talk writing. I think it is working out better. At least I'm not as nervous and stuttering over words. 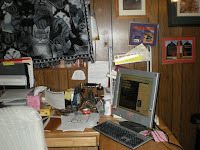 The reason I'm blogging about this today is because in a few hours I have to give a speech to a mystery writers' group. I want to impart how much Christian fiction as a whole has grown and that there are good suspense/mystery books out there in the Christian market. We are the light in the dark. With all that is happening in this world, I'm glad we are here to spread the Word. So what have you been thrust into doing that you aren't comfortable with? Pamela Tracy tagged me. She probably knows I hate revealing my little weirdnesses, mostly because they tend to come out on their own when I give it enough time and why push it. But for the sake of sport, I'm game. Rather than sticking to just reading, I'm going to include writing as well! 1. My best brainstorming for stories comes while doing housework. I hate housework, or at least, would rather b e doing anything else but housework. But the mindless nature of housework tasks must free up my creative mind somehow. It's not uncommon for me to get a burst of inspiration while sorting socks or cleaning the toilet. I have left the laundry basket half full in the middle of the living room, and freshly folded clothes on the sofa and forgotten about them only to come back and find my beagle, Nike, has decided to make a bed out of my clean clothes. But when inspiration strikes the flame, I build a fire. 2. My older sister, Maria, is responsible for my obsession with romance novels. She was the one to bring the first Harlequin Romance into the house 30 years ago, starting a frenzy of book swapping. 4. I'm over 40. For the first time in my life I need reading glasses. I fought this for the longest time until I finally gave in. My husband got a pair of reading glasses before me and when I put them on just to check them out I realized how stupid I was being because I could suddenly SEE the words on the page. Now I have reading glasses in my purse, on my desk, in the bathroom and in the kitchen, just in case that's where I'm at when I'm reading a book. 5. I used to be a Pampered Chef consultant. I love to cook and since writing is such a solitary profession, it was a great way to get me out of the house so I could have adult conversation when the kids were small. As a result, the second most popular type of books on my bookshelves are cookbooks. I have a ton of them. Although my sister, Linda, has me beat there. She's still a Pampered Chef consultant and has a whole lot more cookbooks and kitchen tools than I do. You can check out her website at http://www.pamperedchef.biz/lindamedeiros . 6. I remember the day I decided to write my first romance very well. It was August 1990 and I was camping with my husband. He always loaded the truck with fishing gear and I loaded my duffel bag with romance novels. I would read one after the other in our raft while he was fishing. Then I'd use my flashlight and read into the wee hours of the morning. One evening the flashlight battery died 10 pages before the end of the book. I was tempted to run up to the truck to finish reading but there had been bear sightings at the campground in the White Mountains and since it was 3:00AM I didn't want to meet any hairy animals on the way to the truck. So first thing in the morning, Tom got up to go fishing and I stayed in my sleeping bag to finish the last pages of the Jessica Steele book I'd been reading. When I was done, I said out loud what a lot of writers say, "I'd love to write one of these." At that moment a voice called back to me and said, "Then why don't you do it?" In my still sleepy haze, it took me a moment to realize it wasn't the voice of God, but my husband coming back from his fishing trip early. My husband has been my biggest champion ever since. I credit a lot of my success to his unwavering support. 7. Okay, this one is not reading or writing related but related to my "other" life before writing. I used to manage a rock band called Childhood. It was a Boston based band that won many band competitions and had some regional success. One of the highlights of my time with the band was visiting the MTV studios in NY. This was way back when MTV mostly played videos. They didn't have all those reality shows. It was cool to see the sets and meet the V-jays. Do they still call them V-jays? I'm showing my age again. Years later I was talking to my editor at Avalon Books and mentioned how writers are always told to write what you know, but what I know, the music industry, was always considered taboo to write about. She encouraged me to write about my experience with the band. So I did, and wrote a book called Gypsy Hearts about an up and coming country singer and a recording technician. Cool. I managed to bring that back to writing. I could go on, but I guess I've given you enough info. I won't tag anyone else, but I do invite you to leave a comment and share some of your own writing, reading or life weirdnesses that make you who you are. Remember, when you leave a comment you are automatically put into our monthly drawing for all 4 Love Inspired Suspense books! Some of my bias probably came through at ACFW. I don't want a book that preaches at me. If there's a salvation, it needs to be realistic and flow organically from the story. I want spiritual threads that are realistic -- a book that keeps me thinking after I've hit "the end". Tamara Leigh's books are good about that. I laugh even while getting pinged. The thread can be very subtle. I think about some of Brandilyn's books. But what I must have is a thread of hope. The story world can mirror the gritty world we live in, nut justice should prevail. I should get a sense that ev en though life isn't lived in pretty little packages there is light and beauty in the world. So what are your thoughts? What do you want in a Christian book? Wow, didn't know this would get long. But as a writer, this what I try to do. Nothing is worse as a reader than flying through pages to end a book on a down note. Yesterday was Veteran’s Day when our country paused to remember the brave men and women in uniform – both past and present – whose dedication and courage have kept our nation free. I have the honor of speaking to the Fort Knox Spouses and Community Club, in Fort Knox, KY, on this coming Monday. The luncheon event will focus on the military, and those attending have been asked to bring photos of their veteran heroes. I plan to take pictures of my father, my husband and my son. My Dad and hubby were career Army and served a combined total of fifty-eight years, through WWII, Korea, Vietnam, and both Gulf Wars. Shortly after being commissioned, my son headed to Germany and six months later his unit was sent to war torn Kosovo. Since then he’s had two deployments to Iraq. 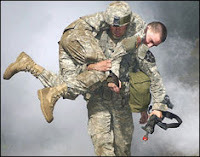 Nothing is as difficult as seeing your child go off to war. Unless the child doesn’t come back. Yesterday we paid tribute to our veterans. 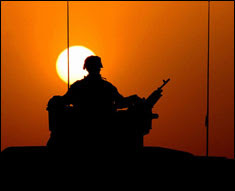 Today I want to send out a great big thank you to our military heroes and also to the people who support them . . . the mothers and fathers, wives and husbands, the children, who endure the long separations usually without complaint. Strengthened by the love and encouragement of their families, our men and women in uniform can focus of the job that needs to be done. Whether in Iraq or Afghanistan, Kosovo or Bosnia, at sea or on land, deployed far from home or stationed within the continental United States, our military needs to know how grateful we are for their service. Let’s do all we can to support our military and their families. Times are tough for everyone. Separation makes these times even more difficult. With the holidays approaching, think what you can do to help. Each year I compile the names and addresses of military personnel from my church so our congregation can send holiday greetings and gifts. Another lady collects toys and clothing for children of deployed soldiers who might not have a bright Christmas. Others support the Atlanta USO so that military travelers have a warm and welcoming place to relax as they wait for a flight home or into harm’s way. Join me this holiday in reaching out to our military. Thank them for their service. Support their families especially during times of separation. I know the Lord will bless you for your outreach. God bless you. God bless our military and their families. God bless the USA. Today we're welcoming Detective Wade Prescott, the hero of THE GOOD NEIGHBOR by Sharon Mignerey, November 2008. Wow, you've just had quite an adventure. I’m the new guy on the police force here in Natchez, Colorado, a small town on the Western Slope of Colorado. I came here on vacation last year. There was a job opening, and I applied. Prior to moving here, I lived in Chicago where I worked on a homicide squad for too long. The crime rate here in Natchez is so low, I’m the only detective in the county, and until this September, there hadn’t been a murder in more than 30 years. That was fine by me since I’d hoped to never investigate another one. So, that’s me, in the middle of this sticky investigation where everybody seems to think the neighbor who found the body is also the murderer. 2. So, during the book you met Megan Burke. Tell us a bit about her. Megan’s friends say she’s a what-you-see-is-what-you-get kind of woman. Personally, I’ve never met anyone deeper. She’s loyal to a fault, and she has this reservoir of faith that holds me in awe, especially given all the tragedy she has survived—her dad killed her sister and her mother died that same year. She has every reason to hold herself back from people, but she doesn’t, which is part of the reason she’s in the current mess. I’d been in town for six months before I met Megan, and I think one of the first thoughts I had was “Why couldn’t I have met her some other way?” She is a physical therapist for a home health agency. The office she works from is down the street from the police station, but I’d never seen her before driving up to the house the morning of the murder. She’s the one who found victim when she went to take out her neighbor’s trash. The thing I know from all the murders I’ve investigated over the years is that the witness who finds the body is often the murderer. After Megan told me she’d had a public argument with the vic, she rose to the top of the suspect list. Except all the evidence that kept pointing toward her was too easy. When did I know it was love? Well, I didn’t expect it to happen so fast, I can tell you that. It shouldn’t have happened at all -- not with her being a suspect in a case that I’m investigating. I probably knew sooner, but the day she was arrested for murder was the day I had to decide whether to follow the evidence or my gut instinct. I’m a good detective, which means I’m methodical. Too much so, maybe. I’ve got a pretty good knack for reading witnesses and knowing when I’m being fed a line. Weaknesses. Well, I don’t have much patience for politics or investigating a case to fit an agenda. That puts me on the outs with the brass often as not. And, I can’t keep my objectivity about cases involving family violence. Missing some crucial piece of evidence that lets a perp walk who goes on to commit another crime. Those are the cases that haunt you. 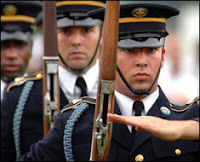 Law enforcement officers vow to protect and serve. I take that pretty seriously. m hoping that living in a small town will help that out. When I moved to Natchez, I was coming off the worst case of my career – a man had murdered his two daughters, and when I couldn’t come up with enough evidence to put him away, his wife killed him. That was a breaking point, and pretty much turned my back on church-going. Looking back on it, I know I had a big hole that I was looking to fill. Not where I want to be but getting better. I see this huge sense of peace that Megan’s faith gives her, and it doesn’t falter no matter how bad things seem in any given moment. I see firsthand how that works for her, and I figure she’s on to something. Now that I’m making space for God in my heart again, I have some of that peace for myself. I’m a pretty simple kind of guy, traditional, and I’d like to think down-to-earth. Warm apple pie with a scoop of vanilla ice cream on top sounds about right, especially since the Natchez Apple Festival is coming up at the end of the month. Thank you Sharon for sharing Wade with us. I look forward to reading how he solves the crime and falls in love. 1) If I live to be 100, and I read a book a day, I will still have books in my TBR pile. I keep that pile in my office closet (it's a double) and in three bookshelves in my bedroom. 2) I usually read three books at a time. There's the favorite. It resides in my hands and if not there, on the table by the bed, on the table by the easy chair, on the patio chair outside, or on the kitchen table. It's the favorite. It travels with me. There's the bathroom book. It's usually one that doesn't grab me so I banish it to the bathroom where it gets read a little each day. It may take me a year to read that book. Or, maybe eventually it will grab me and then it becomes the favorite. There's also the purse book. It's one that is good but not good enough to travel. I can usually finish it in a month. 3) I owe my love of reading to the Betsy books. You know, her sister was Star. My mom took me to the library when I was in second grade. I checked one out. When I finished, I was so disappointed. Finished! I'd gotten to the end! Why couldn't the book have been longer? Mom said, "Don't worry. There's a series." We went to the library again. I was only allowed to check out eight. So, at the age of 40 my mom got her first library card so she could check out books for me. She was most upset when we got home and I had book two finished in a mere two hours and was already reading book three. I think she realized that for the next few decades she was going to invest quite a bit of money in books. 4) My parents weren't readers. They were quite amazed by me. They'd take me to a toy store and say, "Go pick a toy." I'd pick a book. They'd say, "You can have the book, now go pick a toy." We'd do this until I'd have four books and a toy." I was a bit older by then and into Trixie Beldon, Donna Parker, Meg, Robin Kane, and Nancy Drew. 5) Today it's hard to narrow down my favorite reads. Right now I'm reading the latest Potluck Club. I'm reading Shirlee's LIS Protector book. And, I'm reading Twilight. 6) I'm with Cara. The Little House on the Prairie books were constant companions. I reread them to this day. I've probably read them ten times. I wanted to be Laura. As a reader I've always been amazed that the Grandmother's Attic series didn't get the acclaim that Little House on the Prairie did. They were wonderful books. If you have young girls, run to the bookstore and demand that Oleta Richardson's books be back in print. 7) I'm sad Michael Crichton died. I'm sad that Tony Hillerman died. I almost met Tony Hillerman. He was signing at an event I was signing at. I didn't meet him because he had a line. The most famous writer I've met is Ray Bradbury. No, he wouldn't remember me. But, I sure remember him. Now, I've tagged Cathy McDavid, www.cathymcdavid.com Kimmi Waters, www.kimwatters.com Lisa Mondello, www.lisamondello.com Terry Fowler, terryfowler.net and Connie Flynn www.connieflynn.com. Brrrr....winter is coming! What a perfect time to curl up with a wonderful book by the fire, snuggled under a cozy afghan. It's a great time to be dreaming up new ones to write, too, because the temptation to go out and play with the horses or walk the dogs lessens with every ten degree drop on the thermometer! Tonight I've been working on title and cover art suggestions for my next three-book series for Love Inspired Suspense. The process brings into focus the themes of these stories and helps me start to immerse myself in this world--the mountains of Montana--where I'll be (at least in my imagination!) during all the months it takes to write each book. Aren't the covers of the Love Inspired Suspense novels gorgeous? The art department does an amazing job, coming up with such stunning covers for all of the books in this line, don't you think? Now, this has made me curious! Since the LIS covers are all so lovely, and there are lots of other books on the bookstore shelf as well, how do you select which to buy each month? Do you go by title? Author name? Back cover copy? Do you read the first couple pages of several books while in the store, and then decide? I'd love to hear about your selection process! If you find it difficult to make it to the store before the LIS books are sold out each month, there's a handy option: you can subscribe, and have them delivered to your door. Since the LIS books tend to sell out pretty fast, this will ensure that you don't miss your favorite authors! Here's to many hours of reading pleasure for all of us in the coming week! I have been tagged. Stormi tagged me at http://writesthoughts.blogspot.com/. I have to tell you 7 random things about me concerning books, then tag some people. First, I am to post the rules. Here they are. 1. I love to read books and have practically no time to read. My TBR pile could fill a room because I keep buying books even though I don't have time. Actually I could open a small library with them and I gave away 500 books last summer! 2. I am reading for research right now such titles as: Germ, Just the Facts, Ma'am, Strictly Murder, Biohazard, and Deadly Doses. Now you see why I don't have time to read for pleasure. 3. When I totally retire my second job (teaching--I'm subbing right now long term), I plan to read one book for pleasure and one for research. 4. 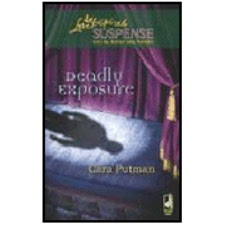 My favorite books to read are a mix of suspense and adventure. I love James Rollins, especially his earlier ones. Amazonia is one of my all time favorite reads. 5. I'm not a huge fan of literary books. I won't read "Oprah" type books. Hold it--I think I have to take that back because I read Night and taught it to my students. It was excellent. 6. When I read for pleasure, I want to be entertained. I want to put the book down and feel uplifted--hence the reason I don't read books with "bad" endings. I could watch the news and get that. I want to see hope in the story and have fun--figuring out who did it or something like that. That's probably the reason I write Love Inspired Suspense. You can get a good suspense with the message of hope. 7. I'm so sorry to hear that Michael Crichton died this week. I loved reading a lot of his books. Jurassic Park is one of my all time favorite reads. 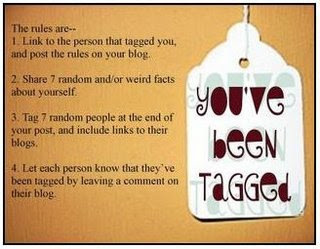 Now I've tagged Cara, Debby, Pamela, Hope and Anita Mae. This week I'd like to talk about the Book in a Week (BIAW) challenges I've been participating in on and off with other writers for over 10 years now. Before you get scared and think that romance authors can actually write a whole publishable book in one week, let me clarify what the Book in a Week challenge is for and why it can sometimes help a writer with output. We all have different ways of writing. Some of us are heavy plotters, some are by the seat of their pants writers and some (like me) are puzzle writers. Regardless of what type of writer you are, revisions and changes are always necessary to make a manuscript a published book. However, sometimes writers get so bogged down in making a particular scene perfect, struggling to figure out what is wrong with it and spending hours and sometimes days trying to change it before they figure out the scene doesn't even belong in the story! It can be frustrating and thwart progress, especially when you're on a deadline. The BIAW challenge is a way for writers to put aside their internal editor and just write the story. It's a marathon of words getting put on the page. While many writers participate in the BIAW challenge, you're not actually competing against anyone but yourself. The writer challenges him or herself to get as much of the story down as they can in 7 days. Not everyone can commit a full 7 days to writing. Let's face it, life gets in the way. However, many writers with full time jobs and families still manage to commit 1-2 hours per day to a BIAW challenge and end up with more pages written at the end of the week than they would have had writing outside of the challenge. Here's how it works. Regardless of what type of writer you are, you need to do a little prep work before the challenge begins. Plot out the basics of your story. If you're a heavy plotter, you can do more. If you're a by the seat of your pants writer, having a general idea of where you are going with your story and knowing a little about who your characters are will keep you from taking the story around the world and then having to cut it all out at the end of the week. 1.) Each day you commit to writing a certain number of hours each day. It doesn't matter if it's 1 hour or 12. 2.) Each day you post the number of pages you've written on your manuscript to the group. Don't get discouraged if someone can write 25 pages a day and you can only write 5. You're challenging yourself! 3.) While you're writing, don't allow yourself to go back and fix ANYTHING. Don't worry about the red squiggly line showing you a spelling error or the fact that you know some of your sentence structure is atrocious. Keep going forward with the story. There will be plenty of time to fix whatever mistakes you've made after BIAW is done. 5.) If you think of something fabulous to add to an earlier part of your book, don't stop and add it during BIAW. Keep a white lined notepad next to you and jot down all the notes on things you want to change or need to add later. Then keep moving forward. At the end of the week, you'll find that while you have a "rough" draft, the bones of your story are there and you are able to use what you have to expand and finish the story on your own. The most I've ever written during BIAW is a little over 100 pages. I do know others who've managed to get a first "rough" draft of a story out in one week. These days I alternate between typing and using Dragon Naturally Speaking so I don't feel crippled after one of these marathon writing weeks. I don't do BIAW every month but I do participate about once per year. The key to a successful BIAW is preparation. The more prepared you are before you start, the fewer stuck moments you'll have as you're writing and the more pages you'll be able to write. There are no hard and fast rules for BIAW. You can do a formal challenge, such as the monthly challenges on the website www.book-in-a-week.com or you can get together with a few other authors and do your own challenge. Either way, it's a great way for writers to challenge him or herself and get their story written faster. 1) I have loved to read since I was about 4. You'll still find me with a book in my hands all the time. 2) My favorite childhood books were the Little House on the Prairie series. Read them voraciously over and over. It's been a blast to read them with my kids now. Laura Ingalls Wilder was truly a gifted writer. Very active writing that paints the scene ... and tells you how to actually build the door, but I digress. 3) My favorite young adult books were the Anne of Green Gables series. And oh, those wonderful CBC adaptations. I loved Anne. And vowed to be like her. I may make lots of mistakes but I try to make the same one only once. I'm far too creative for duplicates! 4) As an adult I discovered Mary Higgins Clark, and feel in love with her blend of suspense. Can't read all of hers, because some of the early ones get a tad weird, but I'll never regret taking a chance on Loves Music, Loves to Dance. A love was born...and for years I said I wanted to write books like that in the Christian arena. Now I do! 5) I'll never regret discovering Bodie Thoene's early series. The Zion Chronicles and Covenant satisfied the reader in me and the part that was passionate about getting history right. Oh, to be able to write gripping stories that honored history. And now I try to do that as well. Isn't, God good! 7) I have been blessed and challenged by Beth Moore and Jennifer Rothschild's Bible studies. Those women have poured out their hearts on the page for us...and if we are willing to dig deep, God can transform our lives, too. Saturday, I headed to Birmingham, Alabama, for the Southern Magic Readers Luncheon. The day’s always fun, and this year was especially nice. The folks are so welcoming and make everyone feel at home. The ladies who sat at my table were great gals. You can see them in the photo. Left to right: Happy Jacques, Theresa Hawkins, Cheryl Kress, Debby Giusti, Cindy Stewart and Lorraine Heron. Happy is Lorraine’s daughter, and I was so glad to get to know her this year! Lorraine and I met three years ago when I attended the first Readers Luncheon, and she’s been sitting at my table ever since. Thanks, Lorraine. It’s always great to see you again! Southern Magic President Susan Vikerstaff sat with us, but she had to check on a few details. The camera caught her walking behind our table. Susan’s so poised at the microphone and is always a gracious leader. Susan’s been a friend for a number of years, and I look forward to seeing her each time I head to Southern Magic events. Authors bring baskets that are raffled off and my table was extra lucky. Cheryl won THREE baskets, Cindy won one, and Happy took home two. Whoo-hoo, ladies!!! So glad you won. Judy Alred won my basket, and we got together for a photo at the booksigning, following the luncheon. Hope you enjoy the American Tourister carry-on bag and all the books and goodies packed inside. I always enjoy seeing Carla Swafford. If you’ve ever been to a Southern Magic event, you know Carla. She’s involved with everything the chapter does, and she does everything so well. Plus, she epitomizes Southern hospitality. I spotted Marie Campbell and Christy Reece when I walked in. Marie and Christy often come over to the M&M conference and they’re old friends. Everyone’s still so excited about Christy’s three book sale to Ballantine Books. Watch for her books coming out back to back in May, June and July 2009. Congrats, Christy, on your well-deserved success! 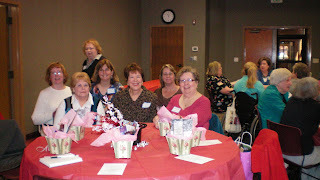 Lots of gals from the Heart of Dixie Chapter in Huntsville were there. New York Times Bestseller Linda Howard always makes the day extra special. She’s such a doll. Beverly Barton and Linda Winstead Jones were there as well. Lynn Raye Harris celebrated her first sale – congrats, Lynn. Kimberly Lang and Kira Sinclair had author tables. Both are members of the Writers Playground blog, the first blog I ever posted on. Be sure to tell Marilyn hi, girls. She and all the Playground writers are wonderful. I’ll see them again in May for the HOD Readers Lunch, another favorite event! Sherry Werth was there as well. Sherry and I met last year at the HOD event. She stops in often on this blog. Thanks, Sherry. It’s always great to see you! Debra Webb received recognition for publishing 77 books!!! Wow!!! How does Deb do it? She’s extra nice and a great writer! Kelly St. John introduced speaker Christina Dodd who told us about how she got started. We all enjoyed hearing her story. Laura Hayden will be SM President next year. She’s a great writer and such a sweet gal. Thanks for making the booksigning run so smoothly, Laura. Jennifer Echols, Giselle Carmichael and I sat at the same table, and we all sold out. Thanks to everyone who bought a copy of COUNTDOWN TO DEATH. Hope you enjoy the story! Thanks Southern Magic for a wonderful day in Birmingham. I’ll see you next year for the 2009 Readers Lunch when Anne Stewart will be the keynote speaker. Come on over to Atlanta, okay? Maybe for M&M 2009! Today we're welcoming Grayson Sinclair, the hero of THE PROTECTOR'S PROMISE, Shirlee McCoy, November 2008 Wow, you've just had quite an adventure. As district attorney, I lead a hectic life. When my brother Jude was nearly killed in a hit and run accident, I dropped everything to go to New York to be with him. When I returned home, someone had moved into the house behind mine. I was pretty sure the person was a vagrant. After all, who in his right mind would live in a house that had seen its best days a half century ago? I knew I couldn't heal my brother, but I sure could boot the squatter out of that house. Imagine my surprise when I knocked on the door and a very respectable and quite beautiful woman opened the door? I like to say that if I'd known the kind of trouble that woman would bring into my life, I'd have turned and run, but everyone who knows me knows that's the farthest thing from the truth. That day changed my life. The danger that followed was just part of the deal. 2. So, during the book you met Honor Malone. Tell us a bit about her. What was your first impression? When did you know it was love? First impression? That she was gorgeous and strong. That she'd fight me if I meant any harm to her family and that she thought she'd win. See, Honor is all about family and faith. Those are the things that drive her and the things that help her through the tough times. She's a nurse and the compassion she has for her patients is just an extension of what she has for those closest to her. It hasn't been easy to raise a daughter alone or to shepherd a teenage sister-in-law, but Honor has managed beautifully. As for love, I think I knew it was coming the minute I looked into her eyes. Of course, it took me a little longer than that to admit it! I'm independent and strong. Those are my greatest strengths and my biggest weaknesses. The thought of someone I love being hurt. 5. If you could change one thing about yourself, what would it be? I would be more committed to helping those in need rather than building my career. I was coming to the realization that my relationship with God wasn't nearly as strong as it should be. I'd spent years thinking I was too busy to worry about where God wanted me to be. As a result, I wasn't pursuing His will for my life. I've realized that it's never too late to live the life God wants for me. I also realize that living that life means a daily commitment to doing what He wants rather than what I want. James 1:3-4 is a reminder that no matter what I'm going through, God is there. That He's constantly working to make me the best person I can be. The trials and struggles Honor and I have been through have strengthened our faith and our bond. I can't regret them because of that. Isn't that the kind of question a woman should answer? Okay, if I've got to pick something, I'll say English shortbread cookies because they're Honor's favorite. This sounds like such a good read! I can't wait. Thank you, Shirlee for sharing Grayson with us today. Last week, at my local RWA group, I did a table talk on grammar. What's a table talk? It means an hour before our regular meeting, people gather at a certain table and a volunteer (in this case me) hosts a discussion on a certain topic. Last December I was asked to do a talk on grammar. Personally, I didn't think anyone would show up. Grammar? Boring. My table was full. And, surprise, surprise, I had a wonderful time. I'd made up a handout (must be the teacher in me) and thought maybe I'd share a bit here on the craftie ladies' site. My workshop started with humor(see statements above)and moved on to terms. Three basic terms: proofreading, revising, and editing. Do you know the difference between the terms? We tend to call everything we do editing, but actually editing has different components. For example, when proofreading, you need only concern yourself with punctuation, spelling, tense, etc. Go ahead, proofread the words below. Can you find all the mistakes? Let me know via comment. I'll check the comment box later today and tell you if you find them all. For days, eight hours, twenty two minutes. Two days, five hours, twelve minutes. Revising is a bit different. Revising means "change." Here's where you add words, delete words, move words - whole sentences even. There's only a single revision needed below. Can you find it? …”Aubrey Stuart?” the voice called again. There was simply no avoiding it. And, well, he didn’t sound mad. That was a good sign, right? Mustering her courage, she turned slowly around and came face-to-face with her ex-husband. “I thought you weren’t arriving until tomorrow,” he said. When most people say, "I want a good editor," they mean they want someone to proofread and revise. But, oh, getting a good editor, what a dream! He/She, with editor pen in hand, truly wants to make sure your facts are in place and make sense. A good editor will find the mistake in the quote below. By the way, if you didn't find the mistake in the quote, you are a good reader, an excellent reader. See, those of us who read ALL THE TIME read right over mistakes because our minds have been train to read what we think/know should be there instead of what is really there. A good editor will catch if you accidentally type that McCain is a democrat. She'll catch if you make Tucson the capital of Arizona. She'll catch if you kill off Trudy in chapter three and then have her attend church in chapter seven (unless, of course, you're writing a paranormal). Since this is a suspense blog, I thought I would talk about the death of the book. Is it happening? For years we have been hearing people predicting that the book was dying—on its way out the door. In the future people will read books on the computer or some kind of handheld device like the new Kindle at Amazon (which I do think is neat but way too expensive). I do think those devices will gain in popularity, but at least for the near future the book is alive and well—holding its own. I read an article in an airline magazine on my way to Fort Lauderdale about a project that Microsoft was involved in. It’s the high school of the future. The library doesn’t have books that you can hold in your hand. Everything is on the computer and all the students have their own laptops. They don’t have textbooks. For the most part things are going along okay, but the students and teachers are complaining there are no books around. They must research on the Internet. Teachers go home and spends hours adapting work from the Internet to present to their students. They miss not having textbooks to supplement their teaching. Now I don’t know about you but I can’t sit at the computer all day and especially read on top of that a story on my computer. I think my eyes get tired from the light on the computer. Don’t get me wrong. I love my computer and what it can do, but I also love a good old-fashioned book to hold at the beach. So I’m hoping there is a place for both in the future. What do you see happening in the next ten or twenty years?